It can be difficult to find accurate information regarding your risk of miscarriage at 6 weeks’ gestation. There are data all over the Internet and most of the time, you find statistics indicating that your risk of miscarriage at 6 weeks’ gestation is about 10 percent. This can be misleading as some women have few risk factors for having a miscarriage, while others have several risk factors for having a miscarriage. The problems with finding such vague statistics are that the risk of miscarriage you find on the internet don’t usually give you the sources of their information so you don’t know if the information is reliable or not and most sites don’t break down your risk of having a miscarriage by other risk factors besides the gestational age of the pregnancy. Things like maternal age and the use of illicit drugs also play into your chances of having a miscarriage. These things must be taken into account in order to have an accurate determination of your risk of having a miscarriage. Most of the statistics you’ll find on the internet are based on data culled from 2 small studies of miscarriage rates and gestational age. One of the studies looked at more than 200 women and tracked their rate of miscarriage from the time of conception to the first six weeks and didn’t look at the risks after that time. The other study looked at almost 700 women who were pregnant and had a fetal heartbeat found by ultrasound. The presence of a fetal heartbeat decreases the chances of having a miscarriage so the statistics on this study do not reflect the actual miscarriage rates at six weeks’ gestation. The risk of miscarriage depends on the number of weeks you have been pregnant. Many miscarriages happen in the very early weeks of pregnancy and may not even be detected because they happen so early that the bleeding you experience might be no more than a regular period and you might just think you are having a late period rather than a miscarriage. The longer you are pregnant, the less is your chances of having a miscarriage. By about 14 weeks’ gestation, your chances of having a miscarriage is less than one percent. 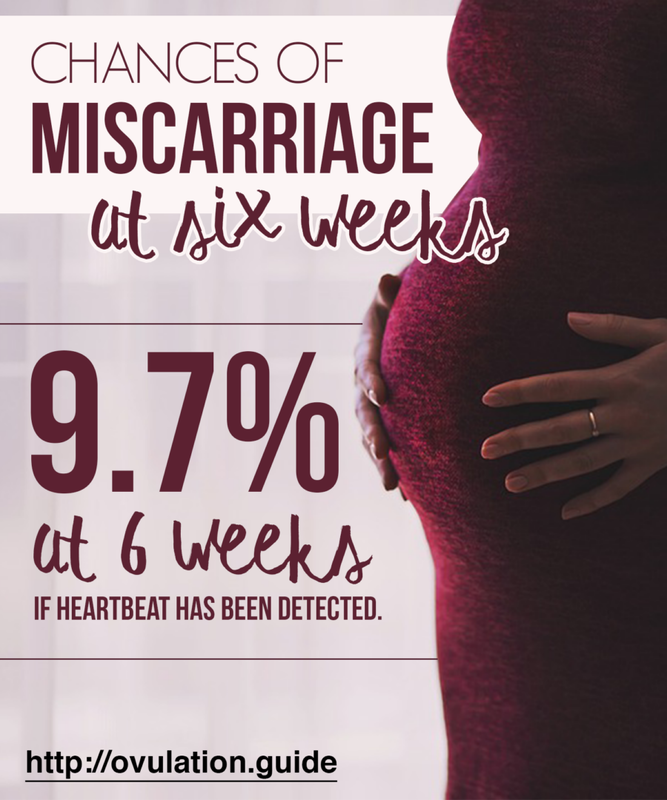 At six weeks’ gestation, the fetus has had a chance to grow but may not have a heartbeat detectable on ultrasound so your miscarriage rate is higher than the rate you’ll have once the heartbeat is detected. In the study done looking at fetal heartbeat and the rate of miscarriage (the second study listed above), all of the women had a detectable heartbeat on ultrasound and automatically had a decreased risk of miscarriage by virtue of having a fetus that was viable enough to have developed its heart. At six weeks’ gestation, if the heartbeat could be detected, the woman still had a risk of miscarriage that was 9.7 percent. In such cases, the problem was usually one of an abnormal chromosome make-up in the fetus, although things like maternal infection, drug use, and high alcohol intake may also contribute to having a miscarriage at 6 weeks, even if the heartbeat has been detected. 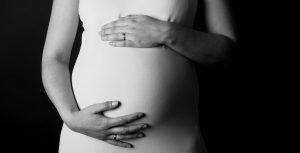 Another study of 668 women who were pregnant looked at the miscarriage rate at varying gestational ages after the heartbeat could be seen on ultrasound. This showed a rate of miscarriage at six weeks’ gestation that was 10.3 percent. Again, something must have been wrong with the fetuses to the degree that development occurred to the point of developing a heart but the fetus wasn’t viable due to other reasons. The statistics on the rate of miscarriage are based on women of all ages when it is well known that the risk of miscarriage increases with maternal age. This is because advanced maternal age is associated with a higher risk of chromosomal abnormalities that lead to miscarriage sometime in the first trimester. For example, for women between 35 and 37 years of age, the percent who had a miscarriage by the twelfth week of pregnancy was only 2.8 percent but, if the woman was older than 40 years of age, the rate of miscarriage was 10.8 percent. The risk of miscarriage at six weeks’ gestation is also based on the heart rate noted on ultrasound. The mere presence of a fetal heart rate is an encouraging sign; however, if the heart rate on ultrasound is too slow, the rate of miscarriage is higher. In one study of first trimester miscarriages based on fetal heart rate, more than 800 pregnancies were evaluated. According to the study, the slower the heart rate on ultrasound, the greater was the risk of miscarriage. In pregnancies at six weeks’ gestation, if the fetal heart rate was above 100, the percentage of women who later had a miscarriage was only 11 percent. If the heart rate was less than 80 beats per minute on ultrasound, the percentage who later had a miscarriage rose to 100 percent. As mentioned, the heartbeat may not even be seen on ultrasound at six weeks’ gestation, even if the pregnancy is normal. Many women won’t have a detectable heartbeat until 8-10 weeks’ gestation. The chances of having a miscarriage before having a detectable heartbeat in one study was 4-5 percent at the sixth week of the pregnancy. This study was done on almost 5,000 women so the accuracy of the data is pretty good. 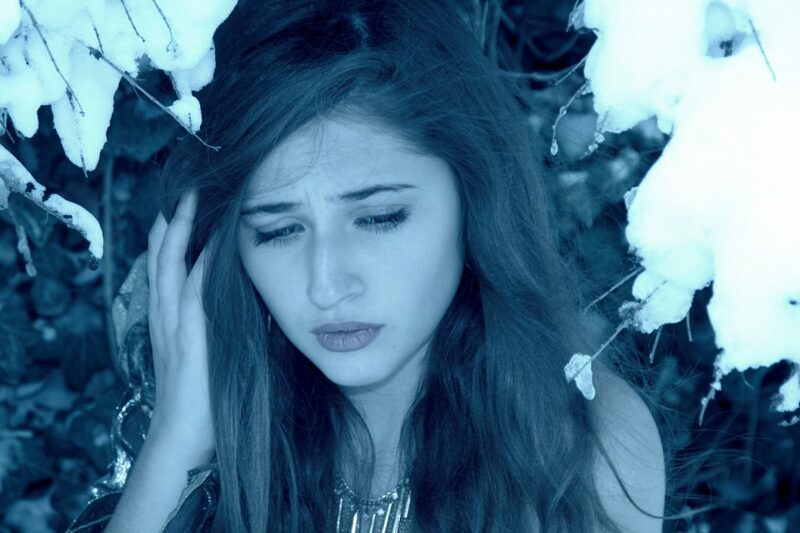 The characteristics of the mother also play a role in whether or not she has a miscarriage. Maternal age is one characteristic that plays a big role in developing a miscarriage. Miscarriage rates rise after the age of 35 so, if you are a pregnant woman who is 35 years of age or older, your risk of miscarriage is higher than a woman who is in her 20s. The personal characteristics of the father also play a role in having a miscarriage. If the man is 40 years of age or older, the risk of maternal miscarriage is higher. This is because, like women, the sperm may have chromosomal abnormalities that result in a miscarriage. Several studies have looked into paternal age and the risk of miscarriage and reveal that being an older father increases the risk of miscarriage by around 25-50 percent. The risk of miscarriage didn’t rise appreciably until the father was older than 40 years of age. My daughter is 6 weeks pregnant and her bpm was 40. She had another ultrasound 2 days later and her bpm went up to 80. She will have another bpm in 4 days. Is there a chance her bpm will continue to go up? Also, what are her chances of having a miscarriage? Thanks!